The Kitchen Gardeners are a diverse group of folks who come together on Saturday mornings to work both individual plots and community beds at our garden behind South Presbyterian Church. Although we all now live in Westchester, we originally came from Holland, Argentina, Paraguay, South Africa, South Carolina, Albany, and the Tri-State area. 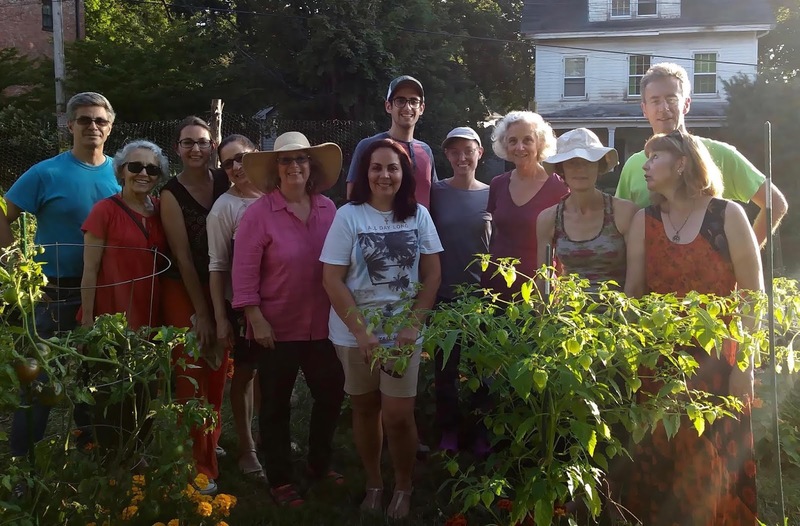 Collectively, we speak English, Spanish, Russian, Italian, French, Hebrew, Portuguese, Greek, and Dutch—although English and Spanish are the only languages you are likely to hear with any frequency at the Kitchen Garden. Some of us are in our twenties, some in our sixties, and the rest are in between. A few of us have known each other for decades; others are brand new friends. We found out about the garden through the food pantry, the Internet, friends, and involvement in South Church and Roots & Wings. Over the last few years, the garden has grown and evolved, following our interests and passions. We’ve moved a heavy wooden garden bed frame to a sunnier spot, dug new vegetable beds, removed a tree, added an irrigation system, and continued to ponder our priorities. Growing food for the food pantry will always be at the top of the list, but we also hope to create an inviting area for workshops, potlucks, music, and other informal gatherings. Our organic vegetable focus has grown to include learning more about composting, planting cover crops to enrich the soil, using homemade weed “teas” to fertilize crops, and letting herbs and greens progress to their flowering stage to attract beneficial insects and later to produce seeds we can harvest and use for the next planting season. This year we grew tomatoes, peppers (hot and sweet), peas, beans, tomatillos, beets, carrots, potatoes, squash, scallions, leeks, eggplants, red cabbage, cucumbers, strawberries, greens (including kale, chard, spinach, collards, and lettuces), and a variety of herbs and flowers. We also started a perennial asparagus bed with one-year-old crowns we received from Freecycle, and we hope to harvest both green and purple asparagus in future summers. It’s all about experimenting, learning, and sharing. Marcelo (Marc) was born in Buenos Aires, Argentina and now lives in Dobbs Ferry right around the corner from the Kitchen Garden. He’s a special education teacher in the New York City public school system and a member of South Presbyterian Church. It was in a church announcement about working with families from the Cabrini Immigration Center that he discovered the Kitchen Garden. Marcelo had been a community gardener in the South Bronx for a number of years during the 90’s NYC Green Thumb garden revolution. A year after he became involved in the Kitchen Garden, its founders asked him to take over the task of running it. “The sense of community is what I enjoy the most about gardening in a group,” he says. Marcelo’s cousin, Marissa, is visiting from Argentina this summer and has joined us many Saturdays to lend a hand. Mark was born in South Africa, grew up in the Midwest, and has lived in the Rivertowns for 30 years. He was drawn to the garden in its early stages for the opportunity to work with people from different cultures. A member of South Presbyterian Church and an environmental lawyer, he was lured to participate in the work of Root & Wings. “I love the smell of dirt and working outside on community projects,” he says. “There is a great camaraderie and conversation about everything from recipes and family traditions to policy and social justice. It has been illuminating to be part of the program life of Roots & Wings, with so many opportunities to learn from experts and hear different points of view on sustainability and food justice.” An avid weeder, he needs to be reminded from time to time about edible weeds others enjoy. 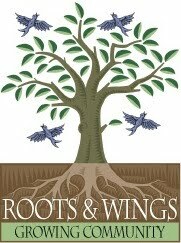 Linda H. was one of the founding members of the Roots & Wings initiative Originally from New Jersey, she now lives in Dobbs Ferry. A professional musician (singer and pianist) and music educator for most of her adult life (working with preschoolers through adults), she is now retired from classroom teaching, but maintains an active private piano studio. Her recent interests include studying watercolor and drawing, chamber music, community service through South Church (Food Pantry and prison concerns), and being a docent for the Old Croton Aqueduct Keepers House. "I have learned so much useful, eco-friendly information from others in the Kitchen Garden. It's been a lovely experience working together in our gentle unstructured way,” she says. I love the mix of people from different places, of varied ages and educational backgrounds." Els is originally from Holland, but traveled to her current home in Port Chester via Moscow, England, New Jersey, and Irvington. She works in the back office at Purchase College and found the Kitchen Garden via her interest in the food pantry. She loves everything about food—growing, cooking, and eating it—and gifted us all with homemade green tomato chutney last fall. “I like trying out new things like unusual herbs and cover crops and I just made a batch of fertilizer from weeds,” she said earlier in the summer, “but I come very much for the company of the team, the shared experiences, discussions, advice, and community.” Els shares a garden bed with Linda M. and this summer they astonished us by growing tomatoes that measure up to a full five inches across! Blanca now lives in Dobbs Ferry but is originally from Paraguay, which she describes as “a small country right at the heart of South America.” A physician who takes care of adults and a public health specialist, she became interested in composting as a way to protect the environment. When she picked up a free holistic magazine and noticed that Roots & Wings was sponsoring a class on composting, she was intrigued. Stopping by the garden one weekend, she met Gabriela and “was drawn to the idea of helping to plant vegetables for the food pantry and impressed by the work being done there by Roots & Wings,” she says. A chance encounter with Laura resulted in the two friends deciding to share a garden bed, where their kale and chard are the envy of all. Solange is originally from Brazil but has lived in Dobbs Ferry for close to 20 years. Susan lives in Dobbs Ferry and visits the garden as often as possible. She is continually amazed by its abundance. Before coming to the garden, she had no prior experience growing vegetables. She has learned a lot about seeds, plants, soil, and insects from her fellow gardeners, and she appreciates the compost, tools, seedlings, water, soil amendments, and camaraderie provided by the group. Susan is particularly interested in learning more about permaculture principles and practices and applying them to the garden. When not gardening, she enjoys her work with human beings. Nick is a fifth grader who likes to plant and harvest. Some favorites are basil, red leaf lettuce, kale, beets, and snap peas. His favorite way to eat snap peas is to pull them off the plant and eat them right in the garden, yum! He likes that he can ride his bike to the garden.